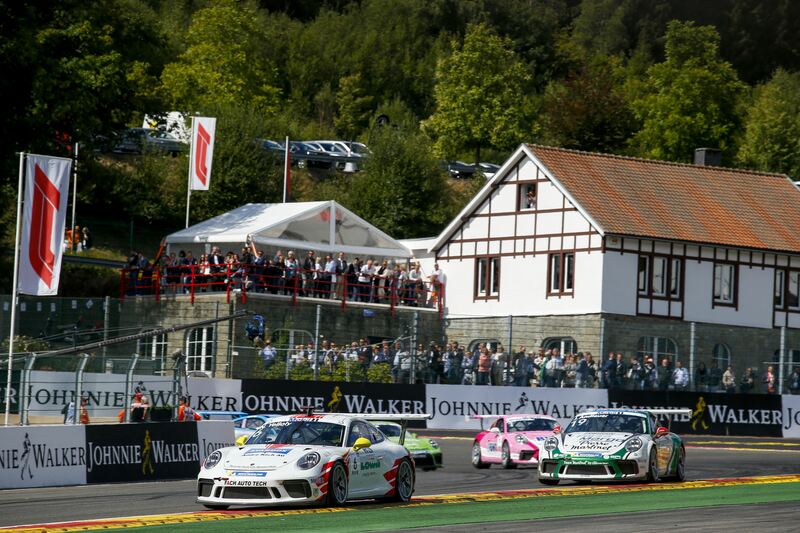 Porsche Mobil 1 Supercup was back from their summer holiday, when the 7th round of the year was run at Spa Francorchamps in Belgium. 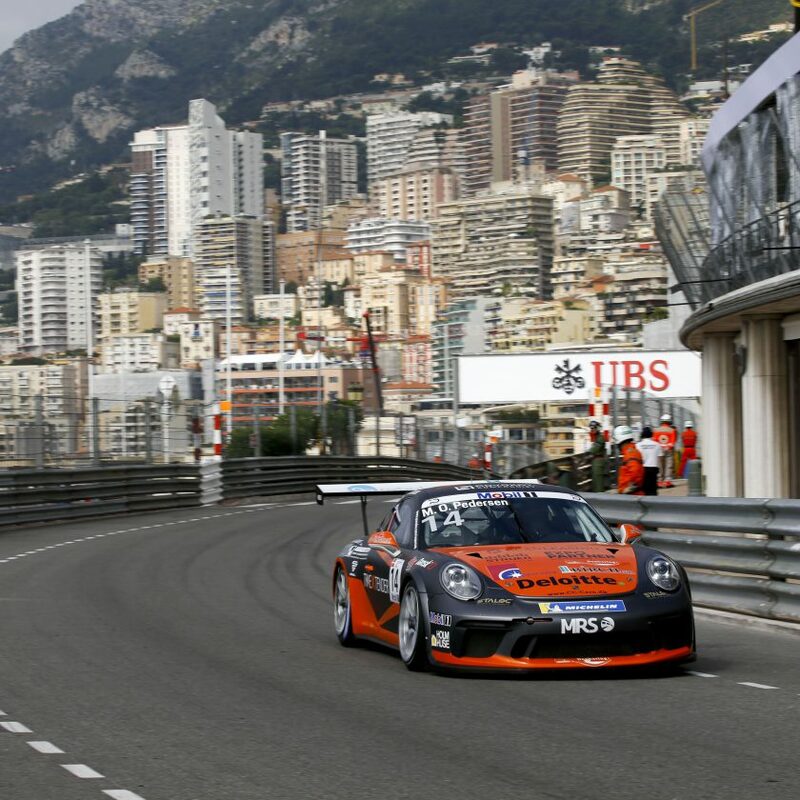 Thomas Preining had secured Pole Position for the second weekend in a row, while Julien Andlauer made it an all Porsche Junior first row. Larry ten Voorde had grabbed third ahead of Zaid Ashkanani. 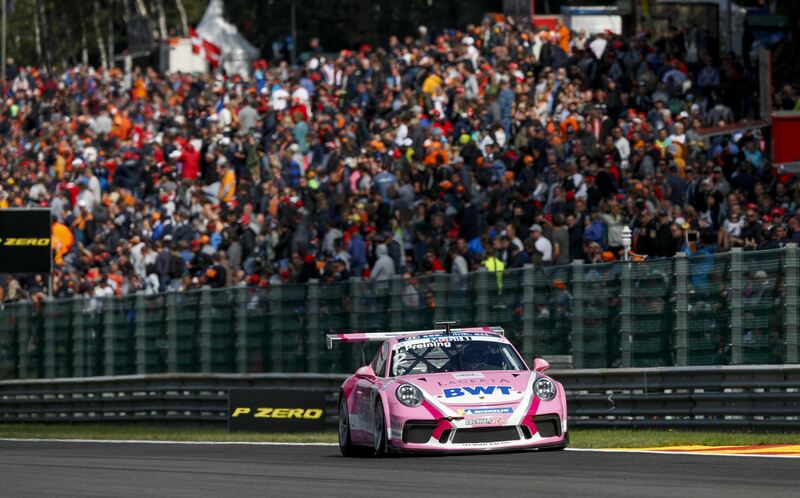 Felix Rosenqvist was the official guest driver of the weekend, and he had qualified the Porsche 911 GT3 Cup car into 10th starting position. The first two drivers in the Championship, Michael Ammermüller and Nick Yelloly were starting in 7th and 5th respectively. 33 cars were lined up under beautiful blue skies with light drifting clouds. While the start went well at the front, there were troubles at the back of the field, with three cars colliding, but all were able to continue. Dylan Pereira wasn’t that lucky. The driver from Luxembourg had technical issues right from the get to, and had to park it on the exit of Turn 1, shortly after the race had started. There was a bit of panic at the front group on the start of the second lap. Andlauer had to take it to the grass going into the La Source hairpin, when ten Voorde edged him towards the edge of the track. The French driver managed to get into 5th position, and had to start chasing a podium position once again. He had just made it into 4th, with a fantastic outbraking manoeuvre around the outside of Yelloly, at the end of the Kemmel Straight, but then made a mistake at the Double Gauche turn, and dropped back to fifth again. Ammermüller was clearly lacking pace in the race today, when he firstly overtaken by Mattia Drudi and then Jaap van Lagen. Van Lagen had to fall back behind again, since he used a bit too much of the run-off area, and decided to give up the spot by himself. Drudi and Andlauer had a close fight on the very final lap of the race, where Drudi made it past the Frenchman. But nobody were able to catch Thomas Preining, who took the third victory of the season ahead of Larry ten Voorde and Zaid Ashkanani. Nick Yelloly finished 5th, right ahead of Michael Ammermüller. Felix Rosenqvist got the car home in 9th, which was a really good result, in a field full of Porsche experts. Dane Mikkel Overgaard Pedersen started 16th, after failing to get a clear lap in qualifying. He raced his way into 13th, but received a 5 seconds time penalty due to track limits, so eventually finished 15th. The Championship has really closed up with this weekends results. Michael Ammermüller still leads, but now only by one point ahead of Nick Yelloly. Thomas Preining is a further 15 points behind, jumping into third, after two victories in a row. The Porsche Mobil 1 Supercup is back in just one week’s time, when the support series to Formula 1 races at the Monza Circuit in Italy.